Ever wondered what the most beautiful places are in Europe to ride your bicycle? Well at Lekker Bikes we put together a list of places for you, some with breathtaking views of nature and others with incredible history. Below you can find the list of our top choices. From the hustle and bustle of the Ring road to the peace and quietness of a wildlife preserve: it’s possible on the 9km long Wiental cycle path leading to Lainzer Tiergarten. 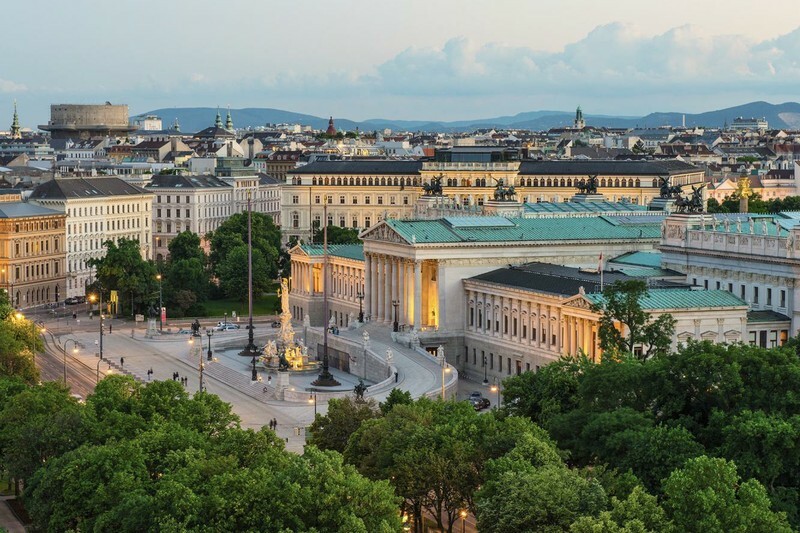 Following the Wienfluss river and the track of underground line U4, you can ride past the world famous Schönbrunn Palace, taking in foodie heaven Naschmarkt on the way. With 5930 acres of grounds to roam in, Lainzer Tiergarten is the perfect place for a relaxing break – or an exciting encounter with a wild boar! There can’t be a top 5 biking routes without Amsterdam being mentioned. With probably being the most famous cycling city in the world, Amsterdam has more biking routes then you can even count, ranging from historical buildings to the wildly acclaimed windmills and tulips. One of these routes take you to the Rijksmuseum. 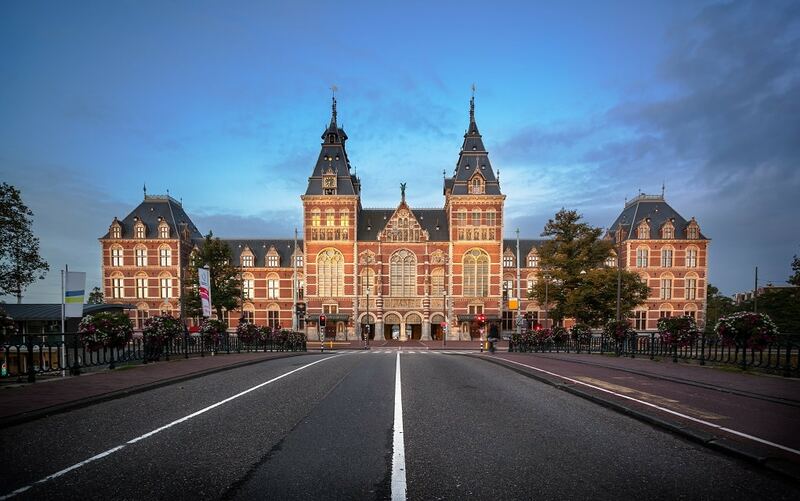 This is one of Amsterdam’s most famous museums, known for its historical artifacts and renowned painters. 5 Years ago the remodeling was completed and now it’s possible to bike through the Rijksmuseum. This is only possible in Amsterdam! The infrustructure in Berlin is getting better and better with more than 900km of bike paths very broad streets and more parks then you can count. This offers you a very different perspective of the city. With so many km of bike paths you have dozens of biking routes you can choose from. 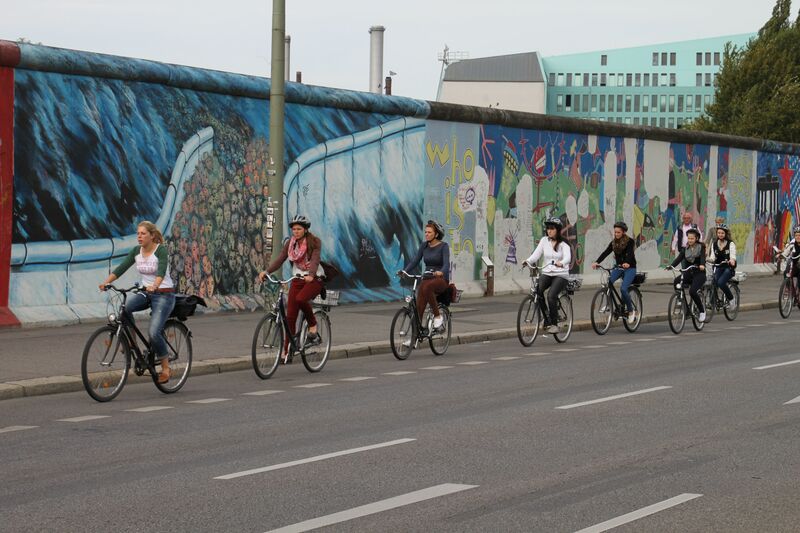 If you want to feel the presence of history riding along the Berlin Wall is the bike path to take. This “small” route is just 160 km long and will let you see amazing spots of Berlin. If you want to cycle the whole route we definitely advise you to stop overnight or take the necessary precautions. Ciutadella Parc, literally translated in English, means ‘Park of the Citadel’. 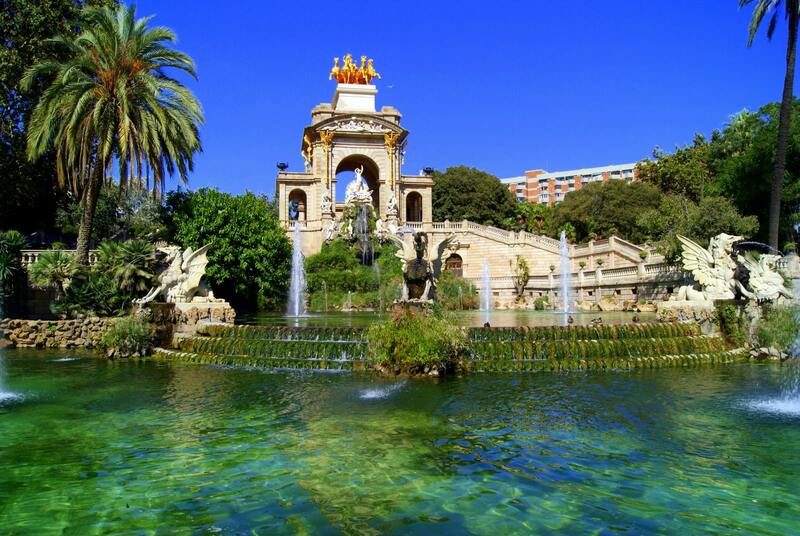 This park replaced the Citadel which had previously dominated the city of Barcelona. Now Parc de la Ciutadella is the green lung of Barcelona and very much worth a visit on two wheels, but in the 18th and 19th century it was a symbol of military repression and violence. At the end of the 19th century the citadel was demolished and this beautiful park was build. You can find a magnificent view of a monumental waterfall, a greenhouse, the Arc de Triumph, the Castle of the Three Dragons and beautiful statues such as the heartbroken female figure and the giant mammoth. With more than enough bike paths going through Parc de la Ciutadella it will make for a great day out. Although Eastern Europe usually sits in the shadow of its Western counterpart when it comes to a good cycling reputation, Prague has been working to make itself a cycling city since 2003. Cycling paths are currently improving as they aim to have a comprehensive network of over 1,000km of cycling infrastructure. The Petrín hill used to be one of kings Charles vineyards and it’s now a widely used park with different attractions for adults and children. 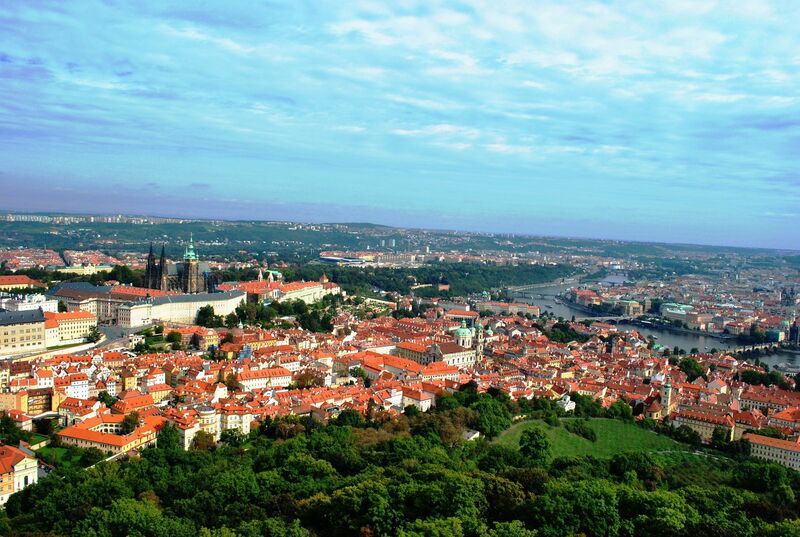 You can spot this hill from all over Prague by a copy of the miniature Eifel Tower. Located on the Petrin hill is the Petrin Observation Tower. The view from the top of the tower overlooks not only the whole city, but on a clear day you can see nearly all of Bohemia. Surrounding the observation tower is beautiful landscaped rose gardens. This makes for a pleasant bike ride all year round. In the grounds there is also an observatory with a telescope open to the public, a hall of mirrors and a impressive wooden church. And as Bonus Bike Path…..
Biking is so normal in Amsterdam that you can even bike through the canals. Explore Amsterdam’s canal ring in your own tempo on a canal bike for a very spectacular view of the city. There are several places you can moor you canal bike, so you can a enjoy a nice cold beer on one of the many cafe terraces in Amsterdam.